Thank you to the ‘Athletic Director’s Advisory Group’ for your role in examining college tennis match format and for making a recommendation to Virgil Christian and the USTA regarding USTA College Match Day. It’s invaluable to have people of this caliber helping us focus on promoting and preserving college tennis. While I agree with much of what is contained in your suggestions concerning the improvements that can and should be made with NCAA Tennis Championships structure, many of my colleagues and I must take strong exception to your conclusion that doubles is expendable. The format that the Advisory Group suggested, and is being ‘tested’ by USTA College Match Day, virtually eliminates doubles (and doubles players) from college tennis matches. The Advisory Group seems to have reached the following conclusion: If we eliminate doubles from a college tennis match, fewer tennis programs will be dropped because we will be better able to promote and televise college tennis. Doubles is part of the teamwork, the camaraderie, and the spirit of what makes the college tennis experience so exciting and important and impactful. Diminishing it to this extent is not only counterproductive to the sport of tennis at the college level, but in turn at the pro level. Indeed, by using the Advisory Group’s format, in their two years at Stanford, the Bryan Bros.- now considered among the greatest champions in the history of our sport - would not have played one doubles match. At the September 17, 2013 meeting of the Pac-12 tennis coaches, the men’s and women’s coaches unanimously rejected any format that didn’t include doubles as an integral part of a college tennis match. As for the Survey referenced in the Advisory Group’s recommendation, I never received it, and when reporting the findings, someone neglected to mention that it had a 2% response rate – far below a level that any reasonable person or committee should seriously consider as a basis to make a major decision with such far reaching consequences as here. As for the ‘Fragile’ state of college tennis cited in the recommendation, I would be the first to acknowledge that tennis isn’t as robust as some other sports these days, but one fact must be taken into account: College tennis is on television more now than it was five years ago, and, as a result, college tennis is currently trending positively in terms of television and internet exposure. Finally, it makes far more sense to have a comprehensive approach with high level representatives from all the major stakeholders, including the USTA, ITA, NCAA, and AD’s working together with Conference Commissioners and television executives to develop a more global solution for college tennis, rather than the ongoing piecemeal approach that seemingly contributed to us all getting to this point today. Once again, I genuinely appreciate having such high level sports administrators weighing in and working to strengthen our sport, but I urge you to reconsider your position on doubles. There are a variety of ways to promote and protect college tennis other than eliminating doubles from college tennis matches. Over the weekend I spent some time watching the men's Division III Central Regional championships, which were played at Western Michigan University and Stowe Stadium. The winners of the nine D-III regionals receive spots in the draw of the USTA/ITA National Small College Championships, which are next month in Fort Myers, Florida. The winners in singles and doubles of the Super Bowl, which includes winners from the Division II, Division III, NAIA and Junior College competitions, receive a place in the main draw of November's USTA/ITA Indoor Championships in New York. The Central Regional champion is Sam Geier of Kenyon College, who defeated Deepak Sabada of the University of Chicago 7-5, 7-6(4) in this morning's final. One of the reasons I went to the tournament was at the behest of owner David Marcus of Own The Zone Sports, a longtime sponsor of Zootennis.com. OTZ, which has developed its own successful line of vibration dampeners, has a come out with a new biodegradable overgrip, just rolling out now. Several players on the University of Chicago team had been testing the grip for the past few weeks, and I spoke to a player who has been using the overgrip as well as Chicago head coach Jay Tee. The player mentioned the extra length of the overgrip, its absorptive properties, and its durability, calling it one of the best grips he's ever used. I asked about the biodegradable feature of the grip, and he said it was an important benefit of the grip to him, but more as an added bonus, since the product itself was so good. For more details on the grips, see the OTZ website, which has testimonials from coaches and players who are not subject to NCAA endorsement restrictions. Qualifying at the All-American championships continues, with the men's pre-qualifying completed today and the first round of qualifying now underway in Tulsa. Of the 16 players to make it out of pre-qualifying, three were freshmen: Andrew Schafer of South Carolina, Jordan Daigle of Virginia and Elliott Orkin of Florida. I can't get the SCORES link to work on the ITA tournament home page, but the qualifying draws have some of the early first round scores posted. The women's qualifying will start on Tuesday in Pacific Palisades. Zoe Scandalis of Southern Cal was the top qualifying seed, but she has apparently moved into the main draw, with Maria Deheza of Texas A&M, a lucky loser, taking her place at the top of the draw. The other lucky losers from pre-qualifying are Kanika Vaidya of Columbia and Mai El Kamash of Ole Miss. Top newcomer Carol Zhao of Stanford was drawn to face No. 7 seed Lorraine Guillermo of Pepperdine. See the ITA tournament home page for the singles and doubles qualifying draws. Anyone who saw Tornado Alicia Black's level of play at the US Open junior championships earlier this month will not be a bit surprised to learn she earned her first professional title today at the $10,000 Pro Circuit event in Amelia Island, Florida. Although unseeded, with no WTA ranking at all, the 15-year-old from Florida defeated No. 2 seed Alexandra Mueller, ranked 449, 4-6, 6-0, 6-0. Mueller did get one title there however, taking the doubles with Brazil's Maria-Fernanda Alves. Mueller and Alves, the top seeds, defeated the Ellison sisters, Roxanne and Sierra, 7-5, 6-3. The Ellisons, who were unseeded, played college tennis at San Diego State. At the $10,000 men's Futures in Laguna Niguel California, UCLA's Marcos Giron won his second singles title and third overall this month, beating University of Virginia graduate Jarmere Jenkins 4-6, 6-1, 6-1. Giron, a junior, won the Claremont Futures three weeks ago, and last week won the doubles at the Costa Mesa Futures with Mackenzie McDonald. This week he received main draw entry via a special exemption, and his win today left his singles record in Pro Circuit events this month at 13-1. He will obviously be one of the favorites for the ITA All-American Championships, which begin on Thursday. The doubles title in Laguna Niguel went to unseeded juniors Yoshihito Nishioka of Japan and Alan Nunez Aguilera of Mexico, who beat No. 2 seeds Keith-Patrick Crowley of South Africa and Ashwin Vijayragavan of India 6-4, 6-2. At the two Challengers this week, Donald Young and Melanie Oudin claimed the singles titles. Young, seeded No. 8, beat No. 6 seed Matthew Ebden of Australia 4-6, 6-4, 6-2 in the $50,000 Napa Challenger final. It was Young's second Challenger title of the year. Bobby Reynolds and JP Smith of Australia won the doubles title in Napa, beating Steve Johnson and Tim Smyczek 6-4, 7-6(2). Neither team was seeded. Oudin, who was unseeded at the $50,000 Party Rock Open in Las Vegas, defeated No. 6 seed CoCo Vandeweghe 5-7, 6-3, 6-3 in today's final to take her first title of 2013. Vandeweghe did rebound to take the doubles title with Tamira Paszek of Austria, beating former Michigan star Denise Muresan and former Tennessee star Caitlin Whorisky 6-4, 6-2 in the final. At the finals of the Junior Fed Cup and Junior Davis Cup today in San Luis Potosi Mexico, top seed Russia and No. 7 seed Spain took the championships. Russia's Darya Kasatkina and Veronika Kudermetova won their singles matches over No. 2 seed Australia's Naiktha Bains and Priscilla Hon respectively, for an insurmountable 2-0 lead. It is Russia's fourth Junior Fed Cup title. The third-seeded United States girls finished third, with Kaitlyn McCarthy and Katerina Stewart picking up singles wins in their match with No. 4 seed Hungary. For more on today's action, see the ITF junior website. Spain won its fifth Junior Davis Cup title, but its first since 2004, with a 2-1 victory over No. 2 seed Korea. Pedro Martinez Portero defeated Kukeon Kang 7-6(6), 6-3, but Seongchan Hong came back to deal Jaume Antoni Munar Clar his first loss of the week 6-1, 3-6, 6-2 to make it 1-1. Despite the lengthy and draining loss, Munar Clar returned to the court for doubles, and he and Portero defeated Kang and Yun Seong Chung 6-3, 7-5 to claim the championship. The US boys lost to Russia 2-0 today to finish in sixth place. For complete scores and results, see the tournament website. The pre-qualifying is complete at the women's ITA Riviera All-American Championships in California, with five freshmen among the eight women advancing to the qualifying round, which begins on Tuesday. North Carolina's Jamie Loeb and Hayley Carter, Virginia's Rachel Pierson, Texas's Ratnika Batra and Florida's Belinda Woolcock all won three matches in two days to get into the qualifying draw. None were seeded, and in fact, UCLA's Chanelle Van Nguyen, the No. 7 seed, was the only seeded player to reach the qualifying draw. Loeb and Carter also advanced to the doubles qualifying. Results and draws can be found at the ITA tournament website. The men's ITA St. Francis All-American pre-qualifying is not complete due to rain in Tulsa yesterday, but qualifying starts Monday. The qualifying draw is available at the tournament page on the ITA website. The United States Junior Fed Cup team saw its quest to repeat as ITF 16-and-under champions end today in San Luis Potosi Mexico, with No. 2 seed Australia defeating the No. 3 seeds 2-1. Australia took a 1-0 lead with Priscilla Hon's 7-5, 6-4 victory over 14-year-old Michaela Gordon at No. 2 singles, but Katerina Stewart pulled the US even with a 6-3, 6-4 win over Naiktha Bains at No. 1 to send the tie to a deciding doubles match. Bains and Hon teamed for the victory in that match, beating Stewart and Kaitlyn McCarthy 6-2, 6-3, to earn a place in the final against top seed Russia. The United States girls will play Hungary for third place Sunday, while the US Junior Davis Cup team, who beat France 2-0 on Friday, will play top seed Russia for fifth place. In the boys semifinals, No. 7 seed Spain, who took out Russia on Thursday, beat No. 3 seed Germany today, with Jaume Antoni Munar Clar clinching the win with a 7-5, 6-4 victory over ITF World No. 2 Alexander Zverev. Spain will face No. 2 seed Korea, who defeated No. 6 seeds Australia 2-1 with a straight-set win in the deciding doubles. For more on the Junior Davis Cup and Junior Fed Cup, see the ITF Junior website. At the ITF Grade 5 in Waco, Texas, No. 14 seed Madison Westby won her first ITF singles title, defeating No. 7 seed Jessica Golovin 4-6, 6-4, 6-2. 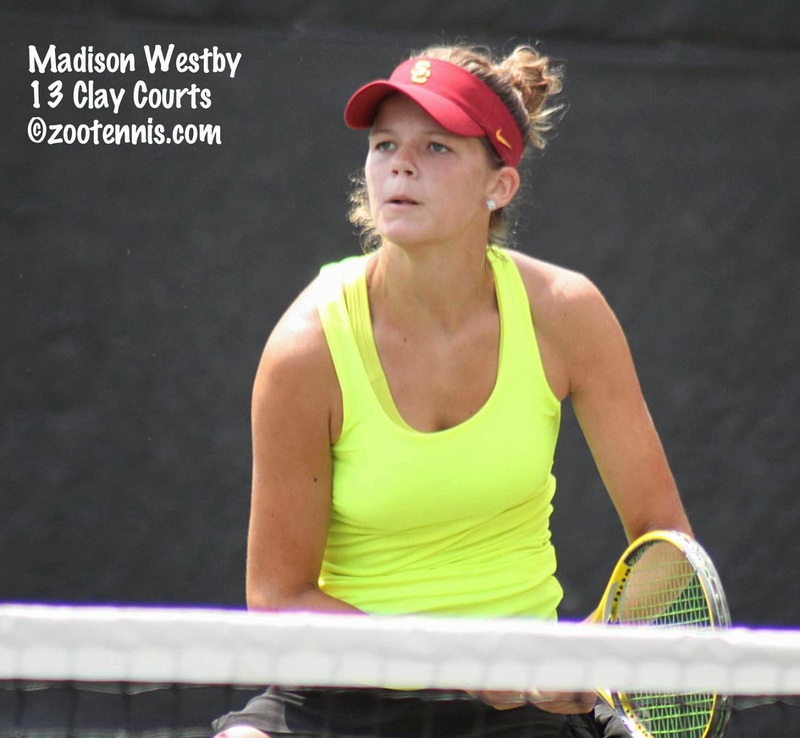 Westby, a 17-year-old University of Southern California recruit, didn't drop a set until the final, beating the No. 3, No. 8 and No. 2 seeds in straight sets. Golovin did pick up the doubles title, with she and Emma Higuchi, the No. 1 seeds, defeating No. 8 seed Jada Hart and Stephanie Hazell 6-7(4), 7-5, 10-3. The boys champion in Waco, No. 2 seed Jake DeVine, was playing in his first ITF singles final and the Kalamazoo 16s finalist came through with a 6-3, 6-1 victory over top seed Nathan Ponwith. DeVine had survived his friend Catalin Mateas 7-6 in the third in Friday's semifinal. Ponwith picked up the doubles title, with Reilly Opelka, with the No. 1 seeds defeating second seeds Mateas and Alfredo Perez 6-3, 6-2. In the Grade 5 taking place in Puerto Rico this week, two more Americans picked up titles. 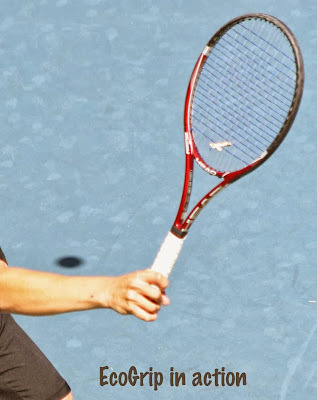 Sixteen-year-old Robert Levine, the top seed, won his first ITF singles title without losing a set, beating unseeded Santiago Salazar of Colombia 6-0, 6-4 in the final. Andie Daniel, also 16, won her second ITF singles title, with the No. 4 seed beat No. 3 seed Mayuka Aikawa of Japan 4-6, 6-1, 6-1 in the final. Gui Gomez and Sami Kirberg of the US won the boys doubles, with Erica Braschi of Puerto Rico and Rianna Valdes of the US taking the girls doubles championship. At the $10,000 Futures in Laguna Niguel, No. 4 seed Jarmere Jenkins, the 2013 NCAA singles finalist and recent Virginia graduate, will play UCLA junior Marcos Giron in Sunday's championship match. Jenkins defeated Sahak Bazrganian 7-6(3), 6-1 in today's semifinals, with the unseeded Giron downing Noah Rubin for the second time in two weeks, this time by a 6-4, 6-3 score. Tornado Alicia Black reached her second $10,000 Pro Circuit final, defeating qualifier Alex Cercone of the University of Florida 6-0, 6-4 to advance against No. 2 seed Alexandra Mueller in Amelia Island, Florida. Mueller beat another University of Florida qualifier, Belgium's Sofie Oyen, 6-3, 6-1. Black made her other appearance in a Pro Circuit final in 2012, where she lost to Jamie Loeb at the $10,000 tournament in Buffalo. Former Ohio State All-American Chase Buchanan has had a great couple of months in South America, picking up three singles titles in Futures tournaments there and making a Challenger semifinal. Buchanan, the top seed, won the $10,000 Bolivia Futures today, beating No. 2 seed Hugo Delien of Bolivia 6-2, 6-3. Buchanan has now won six Futures singles titles, all of them on clay. 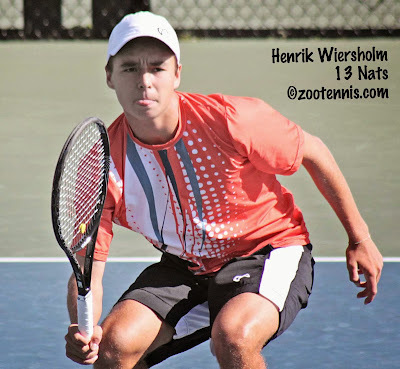 If you've been visiting the Tennis Recruiting Network's website regularly the past few weeks, you know it's the time of year when top juniors give verbal commitments to coaches for next fall (or even for the fall of 2015). Martin Redlicki had already decided he would join his brother Michael at Duke when I spoke to him at the US Open earlier this month, but I was interested to hear from him how much his brother influenced his decision. Martin also discussed his decision to live at home while training at the USTA's Boca Raton Center after spending one semester in the dorms there, and what his plans are for the months before he joins the Blue Devils. Three juniors who recently competed at the US Open have reached the semifinals of the Pro Circuit events taking place this week. Unseeded 17-year-old Noah Rubin defeated Cesar Ramirez of Mexico 6-4, 6-3 today at the $10,000 Futures in Laguna Niguel California, a day after beating last week's Futures champion Haythem Abid of Tunisia, who was the No. 7 seed this week. Rubin will play UCLA junior Marcos Giron, who won the Claremont Futures two weeks ago, in Saturday's semifinal. The other semifinal will feature ITA Player of the Year Jarmere Jenkins, seeded fourth, against unseeded Sahak Bazrganian, who shocked top seed Daniel Nguyen 2-6, 6-1, 6-3 today. Jenkins needed three sets to stop USC recruit Connor Farren 2-6, 6-4, 6-2. 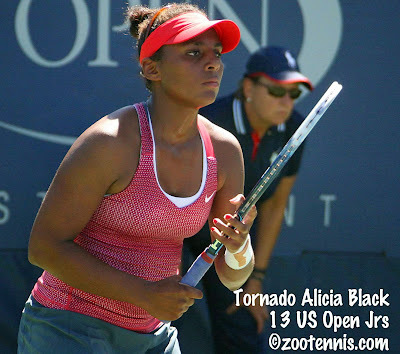 At the $10,000 women's tournament in Amelia Island, Florida, 15-year-old Tornado Alicia Black reached the semifinals with a 6-2, 6-3 win over 16-year-old Marie Norris and will play University of Florida senior Alex Cercone, a qualifier, on Saturday. Belgian Sofie Oyen, another Gator senior, who also qualified, will face the only seeded player left in the draw, No. 2 Alexandra Mueller. Black has also advanced to the doubles semifinals, with future Florida Gator Peggy Porter. At the $50,000 Party Rock Open in Las Vegas, 17-year-old Mayo Hibi reached the semifinals with a 6-4, 7-6(2) win over top seed Ajla Tomljanovic, ranked 88 by the WTA. 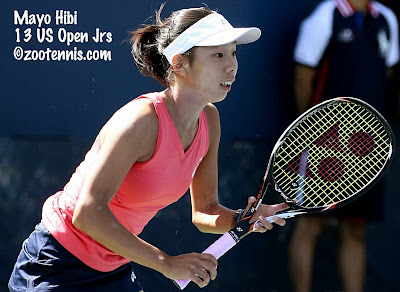 That matches Hibi's best win of her career, as she beat Lauren Davis, then also 88, at the Portland Challenger in July. Hibi, ranked 229 and unseeded this week, will play the winner of tonight's Melanie Oudin - Chanel Simmonds match. CoCo Vandeweghe and Anna Tatishvili are in the other semifinal. The pre-qualifying for the first Division I college major of the season starts Saturday. The women are at the Riviera Country Club in Pacific Palisades, California, and the men are at the Michael D. Case Tennis Center at the University of Tulsa. The draws for the women's tournament are much smaller, with only 64 players in the pre-qualifying, while the men have an open pre-qualifying, which doesn't fill every spot in a 256 draw, but comes close. The women's smaller draws, which are filled with players ranked from the previous years, leave the best freshmen with the task of playing through pre-qualifying and qualifying just to get to the 32-player main draw. UCLA's Jennifer Brady, Houston's Despoina Vogasari, Florida's Belinda Woolcock, Clemson's Jessie Rompies, Texas A&M's Rutuja Bhosale and North Carolina's Jamie Loeb and Haley Carter--all on the ITA's Top Newcomers list--are in pre-qualifying this year, while Carol Zhao of Stanford received a wild card into qualifying. Last year, Virginia's Julia Elbaba, a freshman, took that grueling path all the way to the final, where she lost to Florida's Lauren Embree. Eight of the 10 men on the Top Newcomers list are in qualifying for the men's All-American, welcoming a new sponsor this year in Saint Francis Health Care: UCLA's Gage Brymer, Virginia's Thai Kwiatkowski, North Carolina's Ronnie Schneider, North Carolina State's Nick Horton, Texas's George Goldhoff, South Florida's Alexandru Gozun and Oklahoma's Andrew Harris and Alexandru Ghilea. UCLA's Mackenzie McDonald received a wild card into the main draw, and North Carolina's Brayden Schnur will not be starting school until January. The other two main draw wild cards went to Drew Lied of Michigan State, who won the ITA Summer Circuit tournament, and Tulsa's Carlos Bautista. The men's pre-qualifying draw can be found on the tournament home page. With a 2-1 win over France, the third-seeded US Junior Fed Cup team has reached the semifinals in San Luis Potosi Mexico, keeping alive the goal of defending the 2012 title. That team, consisting of Taylor Townsend, Louisa Chirico and Gabby Andrews, swept through the field without losing a match; this year's team of Katerina Stewart, Kaitlyn McCarthy and Michaela Gordon (who played on the US team that won the ITF 14-and-under championships in the Czech Republic last month), lost their first match today, with Stewart falling to Margot Yerolymos 7-6(1), 7-5 at No. 1 singles, after McCarthy had given the US a 1-0 by defeating Apolline Rassat 6-2, 6-1. That left it to the doubles if the US was going to clinch a semifinal berth outright, and Gordon and McCarthy delivered the point with a 6-4, 6-3 win over Yerolymos and Rassat. The US will play No. 2 seed Australia in Saturday's semifinal, with Australia also needing a win in the doubles to advance over No. 8 seed Brazil. Naiktha Bains got the win at No. 1 singles and teamed with Priscilla Hon for the doubles victory. It's top seed Russia against No. 4 seed Hungary in the other girls semifinal after Russia defeated unseeded Mexico 3-0 and Hungary beat unseeded Bolivia by the same score today. After mostly predictable results in the Junior Davis Cup the first two days, upsets surfaced today, with top seed Russia falling to No. 7 seed Spain 2-1. Jaume Antoni Munar Clar was the hero for Spain, beating Roman Safiullin 6-1, 6-2 at No. 1 singles to make it 1-1, then teaming with Pedro Martinez Portero to take the doubles over Andrey Rublev and Evgeny Tyurney. Spain will play No. 3 seed Germany, who advanced 2-1 over No. 5 seed Japan, thanks to two wins by Alexander Zverev. The US boys, seeded fourth, fell to No. 6 seed Australia today, 2-1. Henrik Wiersholm lost 6-3, 6-3 to Oliver Anderson at No. 2 singles. Stefan Kozlov defeated Akira Santillan 7-6(5), 4-6, 6-3 at No. 1 to make it 1-1, leaving the doubles as the tiebreaker. Wiersholm and Tommy Paul trailed 7-6(5), 4-1 with Marc Polmans and Anderson serving for Australia, but Wiersholm and Paul got both breaks back only to get broken at 5-5, and Australia served out the 7-6(5), 7-5 victory. Australia will play No. 2 seed Korea, who claimed its third straight 3-0 win, today's over South Africa. For complete results, see the ITF tournament site. For more news articles, see the ITF junior website. The first of the ITF fall circuit tournaments in the United States is in Waco, Texas this week, and the semifinals in singles and finals in doubles are set for the Grade 5 event. In the boys semifinals, top seed Nathan Ponwith will play No. 11 seed Evan Zhu and No. 2 seed Jake DeVine meets No. 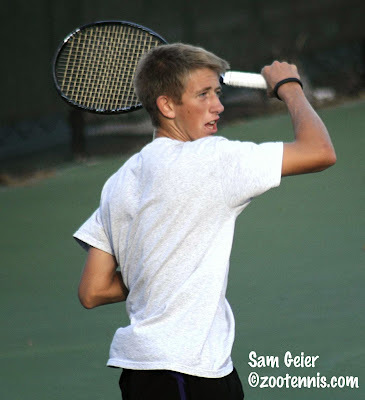 4 seed Catalin Mateas, in a rematch of the 16s final at the Carson International Spring Championships this April. There are also four Americans in the girls semifinals, with No. 7 seed Jessica Golovin facing unseeded Emerald Able and No. 14 seed Madison Westby playing No. 2 seed Racquel Pedraza. Golovin beat top seed Chloe Ouellet-Pizer in the quarterfinals today. Golovin is in the doubles final, with Emma Higuchi, as the top seeds. They will play Jada Hart and Stephanie Hazell, the No. 8 seeds, for the championship. The boys doubles final features top seeds Reilly Opelka and Ponwith against No. 2 seeds Alfredo Perez and Mateas. US Junior Davis Cup and Junior Fed Cup Teams Set Up Showdowns for Semifinals; Townsend Confirms Leaving USTA; Too Many Trophies? Today's Junior Fed Cup and Junior Davis Cup round robin action is complete, and for the second straight day, the teams from the United States posted 3-0 victories. The fourth-seeded boys defeated Bolivia, with Henrik Wiersholm beating Stephan Koenigsfest 6-3, 7-6(3) at No. 2 singles and Stefan Kozlov downing Rodrigo Banzer 6-2, 6-3 at No. 1. Tommy Paul and Wiersholm won the doubles over Banzer and Koenigsfest 7-6(4), 6-4 for the sweep. The boys will now play No. 6 seed Australia in Group C, with the winner advancing to the semifinals. Group A will see top seed Russia against No. 7 seed Spain for a semifinal berth, with both teams winning 3-0 today. Group B is also straightforward, with No. 3 Germany and No. 5 Japan, both 3-0 winners today, meeting for a place in the semifinals. Group D is the only round robin that doesn't have two 2-0 teams. France beat South Africa today to put both those teams at 1-1, with No. 2 seed Korea at 2-0. If Korea beats South Africa Thursday, they make the semifinals, but if Korea loses and France beats Peru, three teams will be 2-1, which means the percentage of sets won will determine who advances. The third-seeded US girls are in the same position as Korea in the boys round robin, in that a win over No. 6 France will advance them to the semifinals, as they are the only undefeated team in Group C after today's win over Colombia. 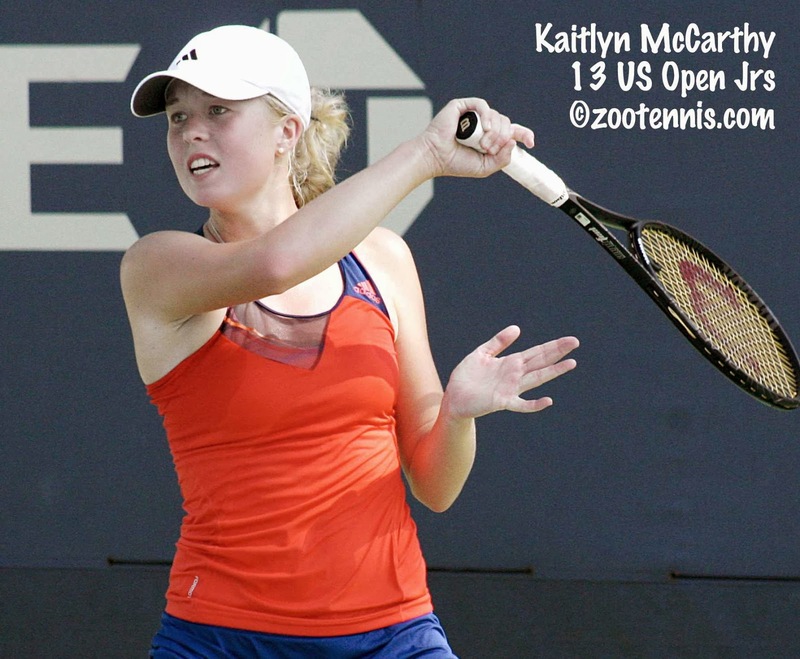 Kaitlyn McCarthy beat Juliana Valero 6-0, 6-3 at No. 2 singles while Katerina Stewart needed nearly two hours to get past Maria Fernanda Herazo at No. 1 singles, 6-0, 6-7(7), 6-4. Michaela Gordon and McCarthy won the doubles over Laura Daniela Arcinegas and Herazo 6-4, 6-1. In the other match in Group C, Slovenia defeated France 2-1, leaving both teams at 1-1. If the US should lose to France, they would still have a chance to move on depending on percentages. In Group A, top seed Russia beat No. 5 seed Czech Republic 2-1 today and will meet unseeded hosts Mexico, also 2-0, for a place in the semifinals. In Group B, No. 4 seed Hungary went 2-0 with a win over Egypt today, and if they beat Bolivia Wednesday, they will advance. If Bolivia and New Zealand win however, that will set up a three-way tie that will be decided by percentages. Group D has No. 2 seed Australia meeting No. 8 seed Brazil, with the winner remaining undefeated and earning a place in the semifinals. For the complete draws and results, see the ITF tournament website. For more articles from Wednesday's competition see the ITF junior website. Thanks to Steve Pratt, who is working at the Pro Circuit's $50,000 Party Rock Open in Las Vegas this week, there is now official confirmation that Taylor Townsend is no longer training at the USTA. Since the US Open, Townsend has been working with former WTA Top 5 player Zina Garrison, who has a non-profit academy in Houston, and Garrison is with Townsend in Las Vegas. 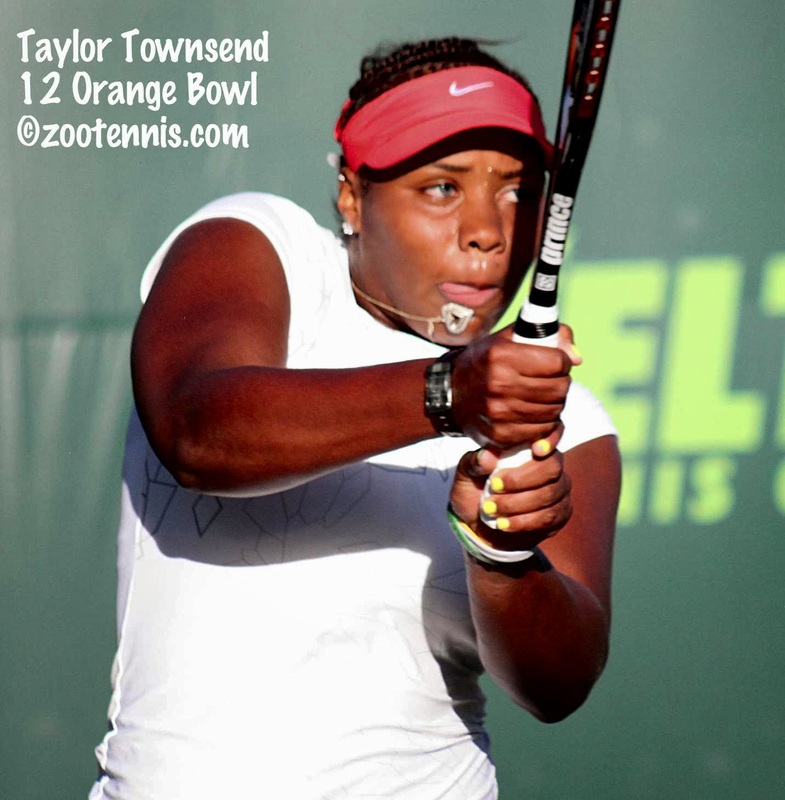 Townsend lost to qualifier and Las Vegas resident Asia Muhammad in first round action today. This CNN Open Court video report on Townsend doesn't discuss her coaching change, but does provide responses Townsend and her mother Shelia on the controversy over Townsend's fitness that surfaced at last year's US Open. The ITF's Junior Davis Cup and Junior Fed Cup competitions for players 16-and-under began today in San Luis Potosi Mexico, with both US teams scoring 3-0 victories in their round robin groups. The only seeded boys team to lose today was No. 8 Peru, who fell to South Africa 3-0. 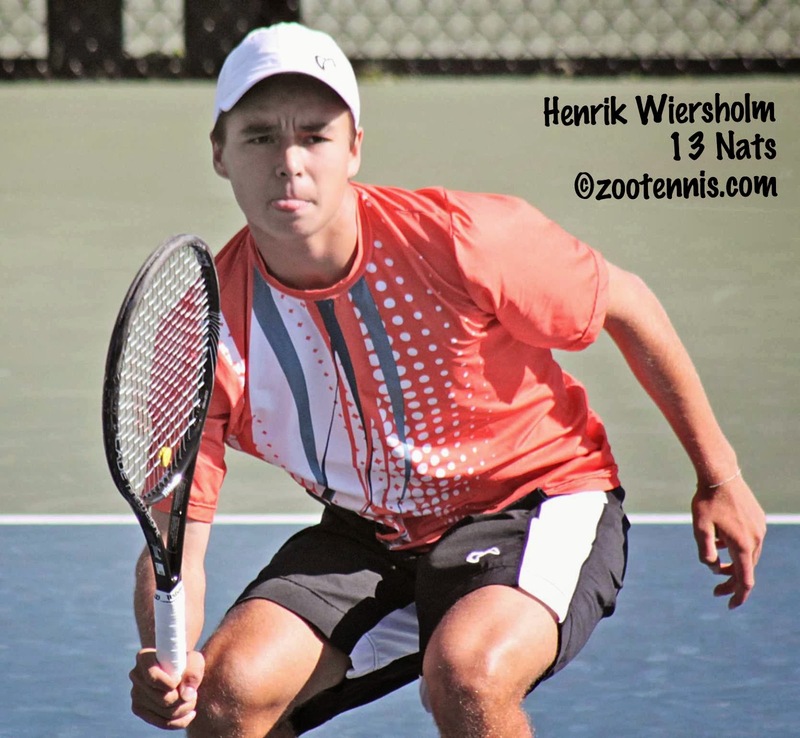 In the USA's 3-0 win over the Netherlands, Weirsholm defeated Caspar Bonapart 6-0, 6-0 at No. 2, Kozlov beat Tim Rijthoven 7-6(5), 6-4 at No. 1 and Wiersholm and Paul won the doubles 6-2, 6-3. In the USA's 3-0 win over Slovenia, Gordon defeated Manca Pislak 6-2, 6-0 at No. 2 singles and Stewart downed Nina Potocnik 6-3, 1-6, 7-6(1). McCarthy and Gordon won the doubles when the Slovenians retired at 1-1 in the first set. Unlike the boys competition today, which went as expected save for Peru's loss, the girls matches were quite competitive. Top seed Russia needed to win the doubles to advance past Korea 2-1, and Mexico upset the fifth-seeded Czech Republic team. Sandy Harwitt has more on the home team's victory in this article for the ITF Junior website. In Group B, Bolivia beat No. 7 seed Egypt 2-1, and in Group D, both Australia and Brazil needed victories in the doubles to move past their unseeded opponents. For complete results and draws, see the ITF tournament site. Somewhat surprisingly, Great Britain is not represented in either competition, having failed to advance out of the European qualifying. Whether that is of any concern to the new chief executive of the LTA is unknown, but if it is, Canadian Michael Downey will be the man addressing the problem, beginning on January 1, 2014. Downey has been president of Tennis Canada for the past nine years. For more on Downey's hiring and the current state of the LTA, see this article from the BBC. For a Canadian perspective on what Downey is and is not responsible for in the resurgence of Canadian tennis recently, see this blog post from Canadian tennis journalist Tom Tebutt. The first few weeks of the college tennis season are difficult to cover, with most Division I teams splitting their teams to travel to college tournaments and to Pro Circuit events. The college tournaments almost always have flights, resulting in several winners rather than one, and there's no central place to go for results, which is my excuse for not providing more coverage of them. A few tournaments have somehow managed to get my attention, whether by twitter or email or previous exposure to them, and one of those, the Audi Napa Valley Tennis Classic, I reported on in yesterday's post. Of the others, a big one took place last weekend in Athens, where the Bulldogs swept the titles at the Southern Intercollegiate Championships. Junior Nathan Pasha won the singles title over teammate Ben Wagland, with Wagland and Hernus Pieters taking the doubles title over Vanderbilt's Gonzales Austin and Ryan Lipman. The article of the finals is here, and the complete draws can be found here. This past weekend, the SEC Fall Classic took place in Nashville, with Vanderbilt as host. 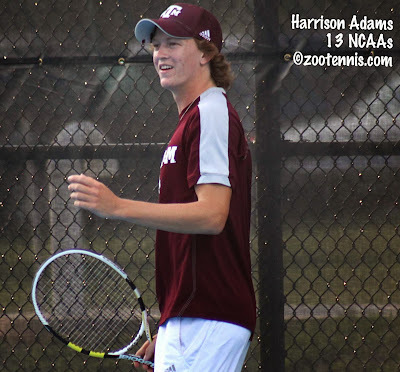 Texas A&M sophomore Harrison Adams, the No. 7 seed, took the singles title, defeating Georgia's Austin Smith in the final, while Lipman and Austin provided the home team with a title when they defeated Mississippi State's Jordan Angus and Malte Stropp in the doubles final. For more on Adams' title, see the Texas A&M website; for the draws and more on Lipman and Austin's win, see the Vanderbilt website. Note that standard scoring(best of three tiebreak sets) was used for singles and that doubles went to a tiebreaker at 7-7. The men's and women's teams at Duke host flighted tournaments in the fall. The women's flight winners two weekends ago in Durham were Miami sophomore Kelsey Laurente, North Carolina freshman Hayley Carter, and Texas sophomore Breaunna Addison. The men's flight winners were Elon senior Cameron Silverman and Duke sophomores Josh Levine and Bruno Semenzato. At the University of Virginia Ranked +1 Invitational this past weekend, Silverman won his flight. North Carolina freshman Ronnie Schneider won a flight, as did Virginia Tech sophomore Andreas Bjerrehus. Sophomore Julian Lenz of Baylor won the HEB Intercollegiate tournament in Waco, continuing the Bears dominance in that event. At the Wolverine Invitational in Ann Arbor, Michigan sophomore Ronit Yurovsky was named the singles champion, which is decided by accumulated points in hidden dual matches. Note that tiebreakers were played at 5-5 in this tournament, and I'm assuming that also means the one-ad format was used. In other college action, the Korean Junior Fed Cup and Junior Davis Cup teams stopped off in Albuquerque last week on their way to San Luis Potosi Mexico to play matches against the University of New Mexico's men's and women's teams while getting accustomed to the altitude. To see how the country's best 16-and-under players, including familiar names Seong Chan Hong and Ku Keong Kang (the names are styled a bit differently), fared against the Lobos, see this article. New Mexico is also breaking ground on a new tennis facility, which it hopes to use to attract additional junior and professional tournaments, as well as major conference and national collegiate events. For more details, see this article from the Albuquerque Journal. On Saturday, I covered many of the doubles performances of the week on the professional circuit; today I'll review the singles results, as well as those doubles championships that weren't decided until today. In the Szczecin, Poland Challenger, which is a 106,500 Euro prize money event, the 2009 ITA player of the year Oleksandr Nedovyesov of Ukraine, the No. 7 seed, picked up the second challenger title of his career, defeating No. 8 seed Pere Riba of Spain 6-2, 7-5 in the final. 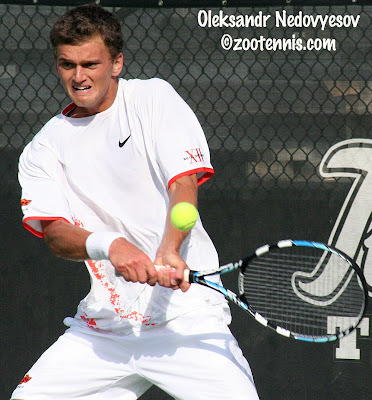 The 26-year-old Nedovyesov, who played at Oklahoma State, (if I recall correctly, he earned his Masters degree before starting to play the tour full-time) will be inside the ATP Top 120 with his victory, which is tantalizingly close to the cutoff for the 2014 Australian Open main draw. At the $75,000 women's Pro Circuit event in Albuquerque, Shelby Rogers picked up her third challenger win of the 2013, with the No. 8 seed defeating unseeded Anna Tatishvili of Georgia 6-2, 6-3 in the final. CoCo Vandeweghe and Eleni Danilidou of Greece, seeded third, won the doubles title, beating unseeded Melanie Oudin and Taylor Townsend 6-4, 7-6. Georgia Tech's Kevin King and Juan Spir, who reached the ITA All-American doubles final in 2011, won the title at the Quito Challenger, saving match points in their dramatic 7-5, 6-7(9), 11-9 victory over Carlos Salamanca of Colombia and Christopher Diaz Figueroa of Guatemala. Former University of Virginia Cavalier Ted Angelinos won his sixth Futures title today in his home country of Greece. Angelinos, the top seed, downed No. 4 seed Francois-Arthur Vibert of France 6-4, 6-4 in the championship match. At the Costa Mesa Futures, former UCLA Bruin Haythem Abid of Tunisia defeated 17-year-old Ernesto Escobedo 6-1, 4-6, 7-5 to take the singles title, his first Futures singles title since 2009. Abid's win gave UCLA a sweep, with freshman Mackenzie McDonald and junior Marcos Giron taking the doubles title earlier in the day. McDonald and Giron defeated the South African pair of Keith-Patrick Crowley and Matt Fawcett, also unseeded, 6-3, 6-2. At the $15,000 Futures in Canada, 2012 ITF World Junior Champion Filip Peliwo picked up his first Futures title by virtue of a walkover from fellow Canadian Phillip Bester. 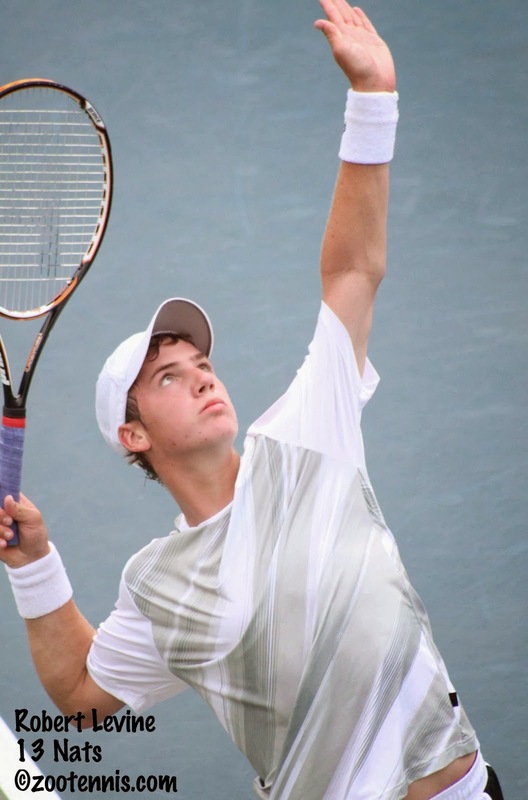 The 19-year-old from Vancouver, who won the Wimbledon and US Open boys titles last year, has been climbing steadily in the ATP rankings the past 12 months. At the end of last year he was 558; when the points from this week's title are added, he will improve on his career-high of 277. Another two-time junior slam winner, 16-year-old Belinda Bencic of Switzerland, also recorded a first today. The reigning French Open and Wimbledon girls champion picked up her first WTA main draw victory in her third attempt. Bencic, a wild card, had lost to Venus Williams last fall in Luxembourg and to Tatishvili this summer in Sweden, before beating 2010 US Open girls champion Daria Gavrilova of Russia, a qualifier, 6-2, 5-7, 7-5 today in the WTA Premier event in Tokyo. Bencic will play No. 7 seed Petra Kvitova of the Czech Republic in the second round. At the Audi Napa Valley Tennis Classic at Meadowood Resort, University of San Diego sophomore Uros Petronijevic went undefeated over the three-day event, then captured the Solinco Wild Card shootout that decides the overall winner and a Futures wild card. Petronijevic defeated Alabama's Daniil Proskura 10-8 in the final. Seven of the eight round robin winners went undefeated in their groups, all of them college players. None of the eight USTA juniors made the shootout, with Taylor Fritz coming closest, going 2-1, but losing out in his round robin group to Stanford's Maciek Romanowicz, who also was 2-1, but had a better sets-won percentage. Sunday's results are available at the ITA website. For more on Petronijevic's win, see the USD athletics website. . Furthermore, 62.8% indicated that matches should last less than 2.5 hours. The ITA also studied approximately 1,500 Division I men’s and women’s matches from the 2013 spring season and the average match length was approximately 3 hours and 20 minutes. Executives from digital and broadcast media outlets indicated that the ideal match length should fall between 2.5 and 3 hours. 3) Highlighting singles competition in the dual match format. For many years, the ITA and NCAA have been looking at ways to address both time and length challenges facing both college dual matches and the NCAA tennis championships. With this as a guiding principle, the Advisory Group unanimously recommended (the margin was unanimous; neither the USTA nor the NCAA voted) that the following be piloted during the 2014 College MatchDays. · Singles first. The singles matches will come first; numbers 1-6 singles will be played to start each team dual match. The integrity of singles will remain the same. They will be best-of-three sets, worth one point each toward the team result in the dual match. As is currently the case, four points are required to win the team match. · Doubles tie-breakers. In the case of a (3-3) tie after the singles results, then three doubles matches would be played using 10-point super tie-breakers to decide the outcome. This would create college tennis’ version of “overtime.” The team that wins at least two of the three doubles matches receives the decisive point and wins the match. · “Clinch” format. Once four points have been reached (“clinching” the match), the remaining matches shall not be completed. · Team warm-up. Players will be expected to warm-up with their own team prior to the scheduled match time and will not warm-up against their opponent before the first point is played. Any format changes require testing and experimentation. The USTA and the College Tennis Advisory Group suggest that these proposed changes to the dual match be “piloted” during the College MatchDay events scheduled for 2014 and look forward to receiving meaningful feedback from all stakeholders. Further exploration of the “split season” idea is also recommended. Subsequent to the Advisory Group meetings, the ITA met with several key Division I men’s and women’s college coaches who were attending the 2013 US Open and USTA semi-annual meetings to also discuss some potential match formats that are time-sensitive. The ITA and this group of coaches suggested that the 2013 fall season and first several months of the 2014 season be used to experiment with an alternative time-sensitive match format. The specific format that the ITA – and this group of coaches – recommends will be widely communicated in short order. As reported at the 2013 NCAA Team Championships. These matches were “clinch / clinch” format, so as soon as doubles was decided, play paused; as soon as the fourth point was won during singles, the match ended.